JONAI, Nov 28 – In the wake of the recent violent incidents at Dimou and Ruksin portion of Assam-Arunachal border in Jonai subdivision, the police administration of both the States have taken measures for intensifying vigil in the border areas in order to thwart any bid to create an untoward situation.The row over the protected boundary between Assam and Arunachal Pradesh refuses to die down with both sides maintaining their claims and counter claims for years together over encroachment of each other’s land. The unhealthy border row is not attended to by Assam government due to the presence of a local ‘boundary commission’ constituted after a Supreme Court directive to find an amicable solution to the dispute.Like the border dispute tension prevails along Assam-Arunachal border at Gumto in Lakhimpur district, another such problem is simmering along the border at Dimou under Dhemaji district. Same problem is noticed at Simenchapori and Kobu-Miniyakhal of Jonai subdivision bordering East Siang district of Arunachal, following unabated encroachment of land falling under the territory of Assam by the Arunachalis.According to reports a large area of Assam land is being encroached by Arunachal Forest Department at Upper Kobu (Miriyakhal) on the north bank of river Brahmaputra. The Jonai sub-divisional administration, following a set of complaints from the local students union had been dealing with the matter. 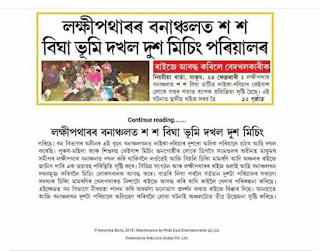 Meanwhile the administration has taken stock of the situation after an executive magistrate had visited the area recently.An unofficial source informed that about 14,000 bighas of land including 8,063 bighas revenue land 6,063 bighas revenue land 6,724 bighas Forest kept of Assam territory lying at a length of 140 kilometer along the border has been encroached by Arunachal people during the last two decades. It is further alleged the Arunachal government has not been maintaining status quo and allegedly continuing construction works over the disputed land of border areas.Leaders of various organisations here including TMPK, AASU,AJYCP (Yuva Chatra) Dhemaji District Corruption Protection Committee and others have alleged that, the most sensitive issue of boundary disputes between the neighbouring states has been utterly neglected by the Assam government which is gradually becoming and causing frequent incidents of violence at the border.Referring to the recent violent incidents at Dimou where four persons of Dimou (Assam) were shot at by Arunachali people on November 3, the AASU finance secretary Tularam Gogoi has blamed the indifferent role of the elected representatives for solving the border problems,. He said that, Minister Bharat Chandra Narah and MP Dr Arun Sarma are keeping mum over the issue, thereby neglecting the security of the local people residing on the vulnerable state borders.The people have demanded the State government to adopt prompt measures on its own over the sensitive border issue and to arrange adequate security measures at the state border areas.